There are many questions about why my Roomba won’t charge. In this article, I’ll help you solve this issue with your robotic vacuum cleaner. But firstly, it’s necessary to have Roomba in your house. This machine cleans dirt, sundry debris, and pet hair on the floor. Thanks to the convenience of Roomba, you can go somewhere else and do something else. Since the flying-saucer shaped vacuum cleaner runs on a rechargeable battery, you now can keep it charged just by purchasing and installing an optional charging station called the Home Base. However, the problem occurs just after a few days purchasing. Many consumers claim that Roomba not turning on or charging at all. Even though they did everything possible, from cleaning the contacts inside for the battery to contact the company’s customer support, there’s still no solution to solve this problem. Now check out this article and find out the reason! What do you do if your Roomba won't charge? What if the light does not display? The Home Base light illuminates yet your robot still won't charge? Can you replace the battery in a Roomba? How many years does a Roomba battery last? How do I reset the battery on my Roomba? What do you do if your Roomba won’t charge? Firstly you must know the series of your Roomba machine. Why? The following solution can only apply to Roomba 500, 600, 700, and 800. In case you just bought the new robot which has never been activated, then the issue may have happened during shipment. You must check to see if the battery is shifted or not – if yes, then simply remove the battery and place it in the same spot properly. As I said earlier, you need the Home Base for the charging; plug in and verify light on that device until you see it starts blinking once every 4 seconds or sometimes it illuminates solidly for 4 seconds and goes out. Then try charging your Roomba in a different outlet; at the same time, test the charger or Home Base line cord to see whether or not it is damaged. Replace the current Home Base with another one if it still does not turn on. The Home Base light illuminates yet your robot still won’t charge? Quickly give the cleaner device a check! Ensure there’s no debris or dirt built up inside as this may create a thick layer of dust on the charging contacts of both the Home Base and Roomba. If found, remove it from the charging contacts using a soft dry cloth. I suggest you should clean it lightly with the melamine foam sponge. If no found, consider removing Roomba from the Home Base. Next, flip it over and disconnect it with the caster wheel. Give the caster wheel a check to make sure there is no built up debris because the robot is unable to reach the charging contacts with too much dirt inside. Do the maintenance once debris found! Roomba 500 & 600 Series: Press CLEAN and hold SPOT and DOCK for 10 seconds. 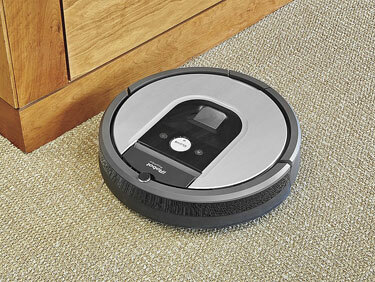 Roomba 700 & 800 Series: Press and hold CLEAN about 10 seconds and you’ll hear “rSt” from the display. Nowadays, there are many replacement battery options for Roomba available on the market. But not all batteries are good; in fact, some even reduce the lifespan of your robot. One thing for sure, the original battery can remain for numerous of cycles if cared properly before it really needs the replacement. Check you Roomba immediately whenever you sense that it strains to work harder than usual. Let it rest or the battery will exhaust faster. If you want to extend the lifespan of your Roomba robot, then you should choose a good battery for it. From my experience, I recommend the iRobot Roomba replacement battery from genstattu.com as its performance is beyond my expectation. I purchased this product a couple of months and guess: it lasted for almost 2 hours in the first time. But as the dust settled, it currently lasts a little over one hour, which is as same as the duration my original battery delivered. If you use Roomba with proper care, then the battery can last for hundreds of cleaning cycles. Before charging your robot, remember to remove the battery pull tab. I advise you to charge it overnight right after purchased Roomba. The normal charging time is at least 2 hours. It seems like the cleaning cycle of your Roomba device start working less effective compared to the first time, right? The main reason may be because the battery has several signs of exhaustion. In this circumstance, you need to reset the battery. Occasionally, I recommend you to do this simple process 2-3 times per week as this is good for your battery recovery as well as helps extend its lifespan longer. When your Roomba won’t charge, there are two common situations – making sure either the Home Base has power or no dust on the charging contacts. Sometimes using the wrong kind of battery as well as having issues with the power source can also make your robot not turn on or charge. With the answers above, I do hope that you’ll solve the problem occurring to your robot easily. If you have tried all the given solution but your Roomba still not cooperates, then quickly call iRobot customer care at 1-877-855-8593 for advice. You can also contact iRobot via its website! Jaskaran Curtis is the executive editor of Reliable Technologies. Back then, he’s had the experience of coordinating a group of approximately 20 editors and writers based in New York. He is the professional of studying and analyzing the latest products in technology area. He's started his career as an editor since 2008.